Shawn has developed a unique program that focuses on four keys that can help you soar to the top. It is based on the acronym SOAR, which stands for: Seeing, Organizing, Acting, and Rejecting. Learn how Seeing: having a vision or a dream for your life, is where all success begins. Determine your destination and build your dream to unlock your highest potential. When you start seeing your future, you'll start believing it's possible for you, and that vision will drive you forward. Discover how Organizing: having a plan to achieve your dream, is essential. Learn how to chart your course and organize your dreams into a "flight" plan, with specific goals along the way. Acting: taking action on your dream is the only way you can make it happen. Once you see your dream and organize a plan to make it come true, you need to act on it. As you do your fears will vanish in the haze. Successful people are always Rejecting failure: it's not an option! They don't let anyone or anything stop them, and they don't care what anyone else may think, say or do. They reject the negative and go for the positive. 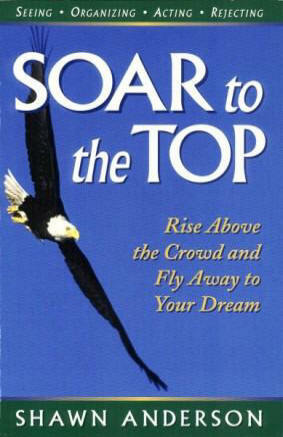 This exciting new book can help you take flight and climb in the direction of your wildest dreams. It'll help you handle any "turbulence" as you soar to new heights. You'll start flying like an eagle and begin seeing the increasing possibilities, beyond the clouds of your life. "The heights by great men reached and kept were not attained by sudden flight, but they, while their companions slept, were toiling upward in the night."